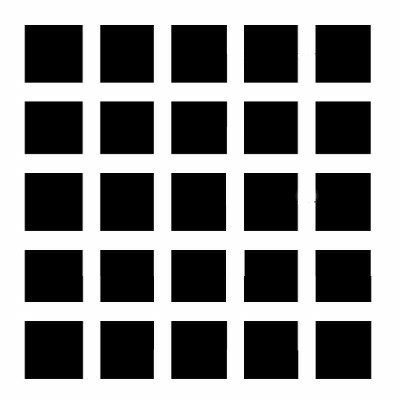 Try staring at this grid and counting the black dots in total, can’t seem to get them to hold still? Hate to break it to you but, it’s all in your mind. This particular illusion is called The Scintillating Grid. This is an optical illusion which consists of small black squares with white lines containing even smaller white dots at each crossing. The Scintillating Grid is a unique and fun illusion that tricks the eye and mind into thinking the dots change colors as you look around the image. If you keep your eyes directly on a single intersection however, the dark dot does not appear. The dark dots will even disappear if you are too close or too far from the image and that can make trying to get the dots to quit moving quite a challenge. So how many black dots are actually on this creative illusion? The answer is actually none; it’s all part of the trick. I myself was convinced there had to be at least one black dot somewhere in the grid in order to pull this off however there simply aren’t any in the entire image. 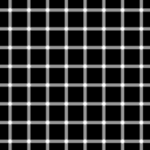 While there are many theories on why you may see these black dots we still aren’t exactly sure why it’s happening and as if attempting to count black dots in this illusion wasn’t enough to drive someone crazy already there are actually several different illusions that are similar to the Scintillating Grid. This particular illusion was discovered in 1994 by E. Lingelbach who actually based this illusion off of the Hermann Grid illusion. The effect of both grid illusions is commonly explained by a neural process called lateral inhibition. Retinal cells in the eye work as light receptors. If only one single receptor is lit up, it views a larger amount of light than when closer receptors are also lit up. The lighting of these receptors hinders the work of other nearby receptors, and the effect is transmitted across instead. In the Scintillating grid illusion, the setup of the white lines creates an issue where there is more light surrounding the intersections than there is along the bands between the intersections. So the region of the intersection is blocked, and darker spots appear. This effect is heightened when you view the grid peripherally instead since lateral inhibition works over greater distances in peripheral vision. Both types of these grid illusions, as well as related illusions, are being used as tools to help further the study of neuroscience. This is only one of the theories that explain why we can see these black dots floating around from grid to grid. So try as much as you would like to catch those black dots or even trick a friend into staring and see how long it takes them to catch on; its part of the fun in enjoying little tricks and illusions such as the Scintillating Grid. If you enjoy moving illusions that make you use your brain power; check out the Penrose Triangle Animation.